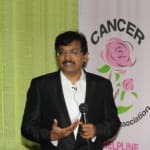 Dr. Raja Sundaram is a renowned Oncologist in Arani, Chennai. You can meet Dr. Raja Sundaram personally at Vasantha Hospital in Arani, Chennai. Don?t wait in a queue, book an instant appointment online with Dr. Raja Sundaram on Lybrate.com. Lybrate.com has an excellent community of Oncologists in India. You will find Oncologists with more than 25 years of experience on Lybrate.com. You can find Oncologists online in Chennai and from across India. View the profile of medical specialists and their reviews from other patients to make an informed decision. I am 65 years old male who has been informed as having the following problems. 1. Enlarged prostrate (informed that tis is due to age) 2. Obstruction in urinary bladdere outlet obstruction. I would like to have your considered advise regarding medication/surgery. Dear , for better advice you got to give me more details of your complaints. Bladder outlet obstruction is caused by enlarged prostate gland which is usually due to age. Give me urine report and sonography reports with full bladder volume, bladder wall thickness and post void residual urine. Do you have some delay in starting urination? how many times do you pass urine in a day and also at night? is the flow weak? do you feel that you are emptying bladder or do you feel some urine is left behind? please post the results with pictures and the answers of the questions. I'm using 2% hydroquinone for past two years, so far I'm happy with the results but I'm worried by people saying hydroquinone can cause skin cancer, can you please help me? Dear sir, there is no conclusive evidence that it Hydroquinone is definitely related to cancer or not. But cosmetic products do contain chemicals and should be user with caution. Any burning sensation or allergic reaction, it should be discontinued. Hello Doctor, I Have a Problem with Urine. Sometimes while I am doing a urine, it feels burns. Sometimes infeels thats some of the urine remains in my urinary bladder after urine. So I co sult a doctor, he said we should check the prostate and said your prostate has enlarged bt it will be recover in 15 days with the given medicine So can you please help me. What are the natural remedies to solve this problem fast. And what are the medicines I should take. What are the vegetables and fruits should I eat to solve my prostate problem easily and in fast way. please also tell some ayurvedic medicines also. please also tell me that its a serious problem or not. It is solved by medicine or not please give details about that also. Avoid spicy food items and not to eat junk food and we also need to avoid peanuts and potatoes in our daily diet and it’s better to take a course of antibiotics after clinical examination. I have a lump in my right breast I have done mammography report says 3 step doctor had given evion 400 is it enough to cure it. Hello, To begin a safe homoeopathic medication to dilute your lump, we need to know the dimension of lump and memo graphics. Evion 400 might subside chest and breast pain can't dissolve the lump itself. Till then take homoeopathic medicine: @ Lapis alb 30-5 drops ,thrice. Avoid,junk food, alcohol and Nicotine. Take care. My father was diagnose as bucuol mucosa carcinoma in upper jaw I want to ask whether this type of cancer can be cured by homoeopathy treatment or better we should go for surgery. Better to go for surgery if operable. I have seen many patients go for homeopathy, Ayurvedic or Unami medicine, some of which contain steroids which suppress the cancer for a few weeks, but does not cure it. It later comes back with a vengeance. Even metastatic at times, when it is not curable. Hi doctor my grandfather suffering from stomach cancer adenocarcinoma last stage. He has burning sensation in stomach. He is not taking chemo therapy. Would you suggest diet for this and he is taking more lemon. Is it good. As you will find in my details I hv Enlarged Prostate for few years. I do not hv problem in urinating. I go for urine abt 2 to 3 times in night and two times in day. My creatinine is 1.0 Urea is 34 Uric Acid is 4.6. Couple of months back got PSA done as 2.5. I do get RFT and PSA done every three months and the same remained normal. May I presume that for any possibility of Cancer I need not to worry or should go for any test further. Moreover what else medicine you suggest as I only take Dutas T daily in the night. I hv some gastric problem which I believe may be due to so many medicines for heart etc I am taking. Is it so. Shall be obliged for your valued advise. At present you don't seem to be having cancer. But you have symptoms of prostate enlargement. Continue taki diya t.
I am 20 year old girl, I'm suffering from itching on breast. Now-a-days its too much, I have not yet taken any precaution. Let me know what best I can do. I wondering whether it is breast cancer or not. Please do let me know. Respected lybrate-user hi don't worry it's not cancer itching is due to excess perspiration. Keep part clean & dry. Apply dusting powder like nebasulf powder 2-3 times a day. For sometime avoid very tight brassiere. Consult later if problem thanks regards. Hello doctor my aunt is suffering from Acute Myeloid Leukemia (MDS RAEB2), I want full information about it now she is in Vellore and also please provide me information about it. Plus it's operation cost as they r middle class family. So how to gather such huge amount any idea. please doctors need your advice. If she is above 60 years then she won't tolerate high dose chemotherapy and transplant then do 5q deletion on bone marrow if it's there then only tab lenalidomide 10 mg once a day for three weeks fb one week off or else options are azacytidine and decitabine.